In scientific terms there are different kinds of memory. Medicine has little to offer. There are some drugs for treating the memory loss that happens with dementia but they are not hugely effective. They give some measurable benefits but whether they are "clinically significant" is controversial. Certainly they are no miracle cure for people with dementia, nor do they improve the memory of anyone else. So I was not that hopeful travelling up to Newcastle to see Prof Mark Moss at Northumbria University. His team is running an experiment to test whether rosemary essential oil could benefit future memory. I'll be honest - this seemed hokey. Rosemary has been linked to memory for hundreds of years. Ophelia in Hamlet says to her brother Laertes: "There's rosemary, that's for remembrance." But that's no kind of basis for a study. She had after all gone insane after the death of her father and was to kill herself shortly after this scene. Rosemary is used in aromatherapy for similar reasons but this hardly seems like stronger evidence. Briefly, here's my position on alternative therapies - I think they're great. They have few side effects and they empower people. From my own work in remote communities around the world I think that ancient traditions of healing have much to teach us and historically they have provided many useful drugs. 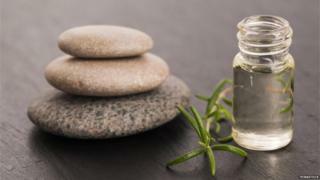 For me aromatherapy falls at that end of the therapeutic spectrum where I would expect to find little effect. It uses nice smells to make people feel… well, nice. Or so I thought. Here's how the experiment worked. The team at Northumbria recruited 60 older volunteers to test the effects of not only rosemary oil but also lavender oil. They then tested these volunteers in a room infused with either rosemary essential oil, lavender essential oil or no aroma. Participants were told they were there to test a vitamin water drink. Any comments about the aromas were passed off as irrelevant and "left over from the previous group to use the room". The volunteers (and I) then took a test which was designed to test their prospective memory. It's a clever test with many layers so you never quite know what's being tested. At the start, objects are hidden around the room in places which you have to remember at the end of the test. Then you perform a series of distracting but fun word puzzles while increasingly complex demands are made of your memory by the testers (in my case two extraordinarily nice and competent graduate students, Kamila and Lauren). "In seven minutes' time from now can you hand me this book?" or "when you come across a question about the Queen in the word puzzles can you remind me to call the garage". My marks were squarely average. I didn't remember to remind Kamila to get her car from the garage in much the same way that I would have forgotten myself. What Mark's team found was remarkable. The volunteers in the room with the rosemary infusion did statistically significantly better than those in the control room but lavender caused a significant decrease in performance. Lavender is traditionally associated with sleep and sedation. Was the lavender sending our volunteers to sleep and decreasing their performance? How could vaporised essential oils possibly have this effect? Name derives from Latin "dew of the sea"
It turns out that there are compounds in rosemary oil that may be responsible for changes in memory performance. One of them is called 1,8-cineole - as well as smelling wonderful (if you like that sort of thing) it may act in the same way as the drugs licensed to treat dementia, causing an increase in a neurotransmitter called acetylcholine. These compounds do this by preventing the breakdown of the neurotransmitter by an enzyme. And this is highly plausible - inhalation is one of the best ways of getting drugs into the brain. When you eat a drug it may be broken down in the liver which processes everything absorbed by the gut, but with inhalation small molecules can pass into the bloodstream and from there to the brain without being broken down by the liver. The implications of this kind of research are huge, but they don't mean you need to spend your days smelling of rosemary and your night sleeping on a pillow of lavender. The effects were measurable but modest and they give us a clue that further research into some of the chemicals in essential oils may yield therapeutics and contribute to our understanding of memory and brain function. It's also important to remember that any drug that has a measurable effect, even if inhaled from a traditionally prepared essential oil, may also have a measurable side-effect. You can't tinker with brain biochemistry and expect things to be simple. But if these studies may help eventually contribute to new drugs to treat dementia there is another very nice benefit - they also restore some credibility to the much maligned alternative health field. Traditional healing practices weren't all quackery. Modern medicine of the kind I practise in London may have many sophisticated treatments but it comes with side effects and can leave people feeling disempowered. We have spent many years rubbishing alternative treatments but there is, I believe, a real benefit in allowing people to take control of their own health with treatments that make them feel better - even if we haven't been able to prove how.